The Sartell-St. Stephen School District has an excellent reputation for quality programs and services offered to students of all ages. The breadth and scope of the curricular program, extracurricular opportunities and specialized programs make the school district one of the finest in Central Minnesota. Staff and administration are dedicated professionals who work closely with students and their families to maintain a high standard of educational excellence. The mission of the Sartell-St.Stephen School District is to inspire the entire community to develop well-rounded citizens capable of becoming successful and contributing members of society by providing outstanding instruction in a caring and supportive environment. Keeping up with a large print fleet can be time consuming ... especially when it’s not your primary job. 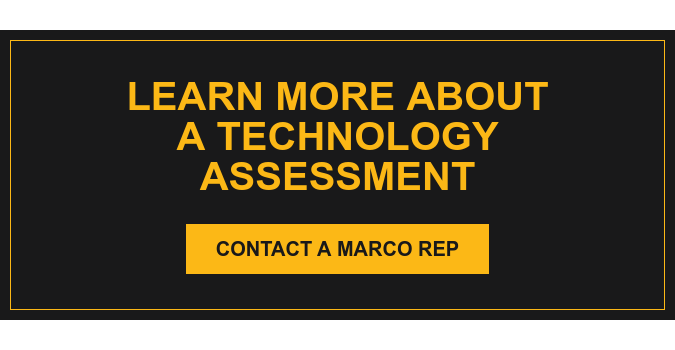 The Sartell-St. Stephen Independent School District (ISD 748) reached out to Marco for a print audit because its IT staff was spending too much time fixing equipment they weren’t necessarily trained on. The district had a previous relationship with Marco and chose to expand on it based on Marco’s experience and reputation. “Marco found areas where we were repetitive, where we could remove a printer and consolidate what we had. They also elaborated on getting an updated fleet, so we could be working with the newest operating systems,” said Kyle Breitkreutz, Director of Technology for ISD 748. Print savings also played an instrumental role with the decision in moving forward with Marco. Together, the Marco team and Breitkreutz’s team came up with solutions that would meet their need to create a more efficient environment. The implementation process was done over the course of the summer without any down time. Breitkreutz commended Marco for how quick and efficient the implementation took place. “The fact that I no longer need to have our staff managing our current fleet is very valuable to me. It’s freed up my IT staff from doing print jobs and allows them to focus on teaching and learning with our staff in the school district,” explained Breitkreutz. Once Marco’s Managed Print Services were in place, ISD 748 experienced a tremendous decrease in its print volume. “With the consolidating that we did, we went from 11 million copies to 9 million copies, thanks to Marco and the processes that we put in place. We also did one-to-one...and are doing more electronic collaboration and sharing,” said Breitkreutz. ISD 748 also had concerns that it would have lengthy down times. Keeping the machines up and running is vital to the district’s students and staff. As the relationship continues to grow, Marco and ISD 748 keep abreast of the latest technologies. “We meet with Marco twice a year to review our printing plan. We do this to make sure we are on pace with our calendar year and we also get updates from our technology advisor on what new technologies and efficiencies are available. Marco has been fantastic with knowledge on the area. When we remodel current schools and begin building a new high school here shortly, we’re already planning on what we’re going to do with Marco,” Breitkreutz explained. As an overall technology partner, Breitkreutz said he couldn’t be happier with the service Marco provides. “The job that Marco does in support, communication and sales is unmatched for copiers, AV equipment, phone support and everything we use Marco for,” Breitkreutz added.